God saw everything that he had made, and indeed, it was very good. In the name of the living God, Father Son and Holy Spirit. You know, I’ve been doing that, and saying that, for a long, long time. I was probably one or two years old, back in Ector County, when my mother and father taught me to make the sign of the cross and to say, “In the name of the Father, and of the Son, and of the Holy Spirit.” And in my family, you didn’t just do it several times during church. We did it at every meal and every night as we said our evening prayers. I’m not sure my parents knew exactly what they were doing as we followed that practice. You see, not only were they reminding us of our baptismal vows constantly, but they were also inviting us into that great mystery we call The Trinity. And I remember when I was around six or seven, sitting in the pews there at Holy Redeemer in Odessa, a little burr headed boy in short pants. And we got to that point in the Creed when we said, “We believe in one God.” And I thought to myself, One God. The Father, the Son and the Holy Spirit. One plus one plus one equals One. And I scratched my little head. One plus one plus one equals One. And years later, when I went to the University of Texas, my parents were surprised that I studied philosophy and poetry rather than engineering. And I thought to myself, really? Because for years, they had been preparing me to become accustomed to mystery, to make my home there, to abide there. And when the poets of the Hebrew people confronted the great mystery of how we got here, the mystery of creation, they wrote that God spoke the universe into being. He spoke light and he spoke darkness. He spoke time into being. He spoke us into being as well. Genesis records, “Then God said, ‘Let us make humankind in our image, according to our likeness. '” Now, it’s worth noting that as God speaks humanity into being, Scripture records the Creator referring to himself in the plural, “according to our likeness.” We’ll circle back to that idea in just a bit. And our modern poets, we call them physicists, have been studying some very old light, echoes from the dawn of the universe. They tell us that when time began, in its first trillionth of a trillionth of a trillionth of a second, the universe began to expand to something that was about the size of a marble.All the stars, all the planets, the entire time space continuum, began to expand from a white-hot mass about the size of your fingertip. When I think of that, I’m reminded of something Martin Luther once said. He said, “God is nothing but glowing love, and a burning oven full of love.” And that simmering cauldron of love exploded in creation. Curiously, our scientists also tell us there are about as many atoms in your eyeball as there are stars in the universe. And we confess that God made all these things, visible and invisible — the God who creates, and redeems and forgives and comforts and sustains. Love, even God’s love, does not exist in a vacuum. Love always arises in relationship, in community. We call that The Trinity. Now theologians, they tell us that God created everything from nothing. In the Latin, they say ex nihilo. It’s impossible to imagine that: we don’t have a frame of reference for it. When I try to think of it, the closest I can get is the story of Beethoven, having gone deaf, creating symphonies when there was no longer any music for him to hear. But this was something much, much more — infinitely more. And while God didn’t create from any raw material, anything physical, I think he called the universe into being out of His love. Divine love was the stuff out of which creation sprang into being. Divine love, which overflowed out of the Father, into the life of Son, who breathed out the Spirit onto the disciples and still breathes it into us. It was love that lit the fires of trillions and trillions of stars, love that crawled up that hill called Golgotha, and it was love that broke through the separation of our many languages on Pentecost. And when the book of Genesis records that we are made in the image of God, I think it means that we are made for love. Jesus told us as much, that we were made to love God with all our heart and all our mind and all of our strength, and to love each other as much as we love ourselves. That’s why Saint Paul said to live in peace and greet each other with a holy kiss, because we are a holy people made from holy love and made to love. Because everyone we encounter, well, they were made in the image of God as well, even the gossips and the soreheads. Thus, C.S. Lewis observed that aside from the blessed Sacrament, there’s nothing more holy in this church today than the person sitting next to you in the pews. We, all of us, were made for union with God. We came from God, and we’ll go back where we came from. We were made for union with the Father, the Son, and the Holy Spirit — the God who is both a plurality and a unity. We work out our salvation together, and the church acts like the church, when our caring for each other pours out, and God is revealed in this community. Our churches can be, must be, windows through which the world can see God’s love spilling out everywhere — down Pecan Street, through Travis Park, up and down Highway 281, reaching out into our homes and our workplaces, our hospitals and yes, even our prisons. So, how do we get there, how do we achieve this union with God? Well, Jesus offered us a real good starting place. In a few minutes we’ll be invited up to the table, to take the life of Christ into us. He told us, “Take, eat.” And somehow, when we do, the life of Christ, the love of the Father, and the comfort of the Spirit begin to take hold in us. And that’s what C.S. Lewis called The Deep Magic. 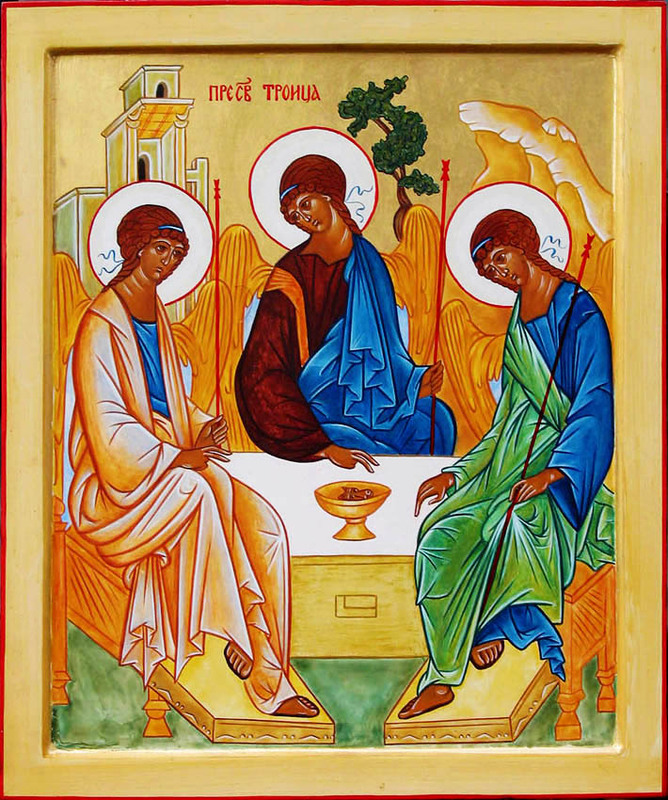 Somehow, we begin to make our home in that wonderful mystery of the Trinity, to abide with God. And then, we find that Jesus is with us, even to the end of the age. Then he said to them, ‘These are my words that I spoke to you while I was still with you—that everything written about me in the law of Moses, the prophets, and the psalms must be fulfilled.’ 45Then he opened their minds to understand the scriptures,46and he said to them, ‘Thus it is written, that the Messiah* is to suffer and to rise from the dead on the third day, 47and that repentance and forgiveness of sins is to be proclaimed in his name to all nations, beginning from Jerusalem.48You are witnesses* of these things. 49And see, I am sending upon you what my Father promised; so stay here in the city until you have been clothed with power from on high.’ Then he led them out as far as Bethany, and, lifting up his hands, he blessed them.51While he was blessing them, he withdrew from them and was carried up into heaven. *52And they worshipped him, and* returned to Jerusalem with great joy;53and they were continually in the temple blessing God. * Luke 24: 44-53. He said to them, ‘Thus it is written, that the Messiah* is to suffer and to rise from the dead on the third day, 47and that repentance and forgiveness of sins is to be proclaimed in his name to all nations, beginning from Jerusalem. 48You are witnesses* of these things. In the name of the living God, Father, Son and Holy Spirit. Good morning, good morning. And welcome to you all as we celebrate the feast of St. Boniface, a great saint of the Church. He was born somewhere around 675 A.D. in Wessex. At birth, he was given the name of Winfred, but later took the name of Boniface, probably when he was ordained a bishop. 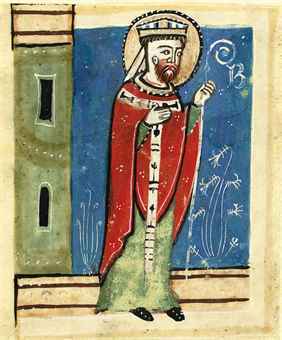 In 716, he set out as a missionary for Frisia, in modern-day Germany. There’s a wonderful old legend about St. Boniface. They say that one winter he came across some men who were about to offer up a child sacrifice to the pagan god Thor. Boniface stopped the murder of this child by going over to an oak tree and striking it. The tree fell to the ground. When all the snow, they saw a small fir-tree there. Boniface pointed to the tree, which was green in the dead of winter and announced, “That is the tree of life and this boy is to live not die.” He then pointed at the tree again and said, “This tree does not die in winter like others but lives and it symbolizes the eternal life offered to you through Jesus Christ.” He then noted that the shape of the fir-tree is triangular and thus represents the Trinity of God. Upon this declaration, the men repented and gave their hearts to Jesus and they spared the boy’s life. So, what’s the point of that story? You know, neuro-psychologists have described something called a perception bias. It’s sometimes called selective perception. It’s the tendency of the brain to seek out what it’s looking for, and to disregard all the other noise around it. It explains how we do those Where’s Waldo puzzles, and how the brain finds what it’s looking for and sets aside everything else. It explains why we see the good in people if we’re looking for it and why, if we go searching out the ways in which people can be selfish and cruel, we’ll find that, too. What does that have to do with the story about St. Boniface? I think it explains the reason St. Boniface saw eternal life in Christ when he looked at the evergreen fir-tree. And it explains why he saw the life of the Trinity when he noticed the triangular shape of the tree. He saw those things because he was looking for them. And that’s why St. Chrysostrom observed that unless you can see Christ in the face of the beggar on the street, you’ll never find Him in the chalice. And so, we come to today’s Gospel reading. This reading comes right after the story of the road to Emmaus. And we wonder, “Why didn’t the disciples recognize Jesus? How could they not see him, right beside them?” I think part of the answer is that they didn’t see Him because they weren’t looking for him. They thought he was dead; there was no reason to look for him. But in today’s Gospel, Jesus tells the disciples, tells us, that we are to be his witnesses. We are to see and hear, and speak of what we’ve seen and heard: that Jesus is risen, that he preached repentance, and promised forgiveness. And that He’s still with us. So, what are we supposed to be looking for? He told us: “Seek ye first the kingdom of God.” If we follow Jesus, that’s our perception bias. I pray that we’ll look for it, because He promised that if we did, we’ll find it. Amen.